"Highway 666 AKA: "The Devils Highway" and "Highway to Hell." On Highway 666, an endless bound of unexplained phenomenon has occurred throughout history. Considered to be one of the most famous roads in North America, this road expands for a distance that is equivalent to approximately two hundred miles. This road starts in the city of Monticello in the State of Utah and extends to the city of Gallup – which is located in New Mexico. One may also access this haunted highway in the southwestern region of the State of Colorado. As you drive down this particular highway, you will pass a large amount of majestic scenery such as beautifully situated rocks, tall cactus plants, and the desert dirt. Despite the fact that this highway is so popular, many travelers work to avoid this desolate span of road. Here, you will learn about the unexplained phenomenon of Highway 666. Highway 666 has been hailed as one of the most haunted places in America. It is located in the region that is identified as the “Four Corners”. Many know the “Four Corners” as the States of Utah, Colorado, Arizona, and New Mexico – not the entire states, only certain geographical locations of each state. In the year of 2003, the United State renamed the ominous highway to U.S Route 491. Christians believe that the number that is reflected in three sixes represents what they refer to as the “Number of the Beast”. When this highway was under its assumed evil number identifier, many referred to it as the “Devil’s Highway”. Based on statistics, there were an unusually high number of accidents and fatalities on this road when it was named 666, so many gained the belief that anyone that traveled on this road would immediately be cursed. Throughout the history of the highway, each and every single accident and death was reflected as a situation that occurred because of the evil that was rumored to reside on and around this stretch of road. When the United States renamed the road to U.S Route 491, the statistics associated with accidents and deaths was drastically reduced. Many say this is because of the fact that individuals no longer experience the psychological fear that something WILL happen to them while traveling down a highway numbered 666. There are some, though, that claim the number 491 fails to lure the same evil spirits that are said to lurk along this highway in the same manner that the number 666 does. Many consider this unexplained phenomenon quite perplexing. One of the most widespread stories surrounding the unexplained phenomenon of the haunted Highway 666 is the story that covers experiences that involve an ominous, black sedan that appears to charge individuals driving on this long stretch of road. Many individuals that have traveled this road have stated that as doing so, they began to experience an intense degree of fear as the sun sets on the lonely horizon within their view. Once darkness falls on the desolate road, the witnesses claim to see headlights coming up behind them. Despite the fact that they reach high speeds, the car seems to gain on them quickly. Many pull over in order to get out of the way of the dangerously close vehicle. Many witness the vehicle speeding fast past them. Others look up to view the vehicle and discover that there was no vehicle at all. Is this a hallucination induced by the desert, or does Satan truly intimidate travelers in a mysterious black sedan? Many individuals that have traveled the haunted Highway 666 claim to have been subjected to a pack of vicious, threatening dogs. These dogs are often called the “Hounds of Hell”. The witnesses claim that these supernatural beasts have the capability of running as fast as a vehicle is able to drive – regardless of what speed is reached. These hounds are believed to be responsible for numerous traffic accidents that have occurred on the road and the deaths of those that have lost their lives on the haunted road. Many have expressed the fact that these seemingly supernatural beasts have the power to literally shred tires with their razor sharp teeth. Many individuals claim that they may jump into the windows of vehicles driving along the road and that they literally attack and maul the individuals in the vehicles. Many people have had complications with their vehicles on this haunted highway. Cars are known to overheat and even experience flat tires. Many individuals that have had to pull to the side of the road have reported an evil spirit that drives a semi truck at extremely high speeds from one end of the road to the other end of the road. Many claim that they have been hit by this truck or come close to being hit. They express the fact that the truck seems to intentionally aim for them. It is believed that the spirit that controls this semi truck is angry and despises anything that contains life. There are many hostile spirits that are said to reside on the haunted highway that is identified by the evil numbers of the beast, 666. There is one spirit that does not seem to be so hostile. This spirit is believed to be that of a young girl that is typically seen standing on the side of the road in a gown that is white in color. While there are no reported cases where this ghost seemed dangerous, individuals claim that she seems unusual. She is said to have a sad, unnerving expression that prompts the concern of any individual that spots her spirit in the desolate desert. When people approach her, it is said that she literally disappears. There are many legends that are part of the Native American culture. One such legend that the Indians have is about a group of people that have the ability to transition into various types of animals. These people are typically referred to as skin walkers. This act is often referred to by those that study anthropology as “shapeshifting”. It is believed that medicine men were skin walkers. Many claim that the spirits of these skin walkers exist today on highway 666. It is believed that they are able to immediately transform into an assortment of animals along the highway and will appear suddenly in front of oncoming traffic. As a result, the vehicle would instantaneously become involved in a potentially fatal accident. Many stories that circulate that pertain to the skin walkers that are said to be along U.S Route 491 occur to travelers in an effort to “warn” them not to continue down the road that they cherish as theirs. Many sightings may appear. If the traveler fails to heed to these warnings, it is believed that an evil spiritual shaman will appear in the seat of the vehicle – especially the back seat. The purpose of this evil spirit is to obtain the soul of the driver. It is believed that the shaman’s magic will result in an accident or other type of situation that takes the life of the driver so that they may immediately gain the person’s soul as they transition from the physical world into the spiritual world. 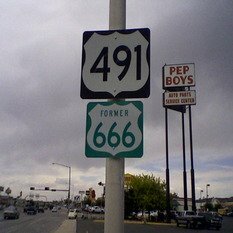 Many individuals that have started down the ominous path identified as either Highway 666 or U.S Route 491 have seemingly disappeared without a trace. In some cases, a vehicle or another part of the person’s property have been located, but in other cases there is no trace of any evidence that indicates that the individual has even been on the road at all. Many that have disappeared for extremely long periods of time have reappeared with no explanation several hours or several days later. These individuals typically have no concept of time and have not felt as if they have been away for very long. In many instances, they have no recollection of the events that have previously transpired. Then, there are many that have traveled down the ominous highway and have discovered that they took longer than expected based on the accounts of others and are unable to explain the loss of time. This unexplained phenomenon has happened several times throughout history. There are many haunting that are said to occur on Highway 666. The number “666” is often referred to as the “Mark of the Beast” by those that have read the Bible and/or believe in the words that are contained in the Bible. Individuals that travel this highway often express the fact that there is an immense degree of fear, terror, and evil on the road. Many believe that the number of 666 induces so much evil that it is evident on the road that represents the number. Then, there are others that believe that the highway was constructed over a burial ground that Indians used when they resided in the area. Many will avoid taking the highway at all costs. This is especially true if there is a full moon and it is dark outside. If you are interested in haunted highways, the unexplained phenomenon on Highway 666 is one location that will succeed at capturing your interests. Anyone that has an appreciation for haunted places to go and the unexplained phenomenon of the paranormal world will enjoy investigating this haunted highway.